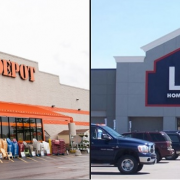 By almost any measure, Lowe’s and The Home Depot are the 2 largest hardware stores in the United States. In 1989, The Home Depot passed Lowe’s to take that #1 spot and that’s how things remain today. This video focuses more on Lowe’s, specifically how they’ve grown, how they’ve competed with The Home Depot over the years, and their potential to take back that #1 spot.